The CTO of the Year award has been handed out since 2010 to inspiring leaders who have made a significant contribution to their company’s technological competences. 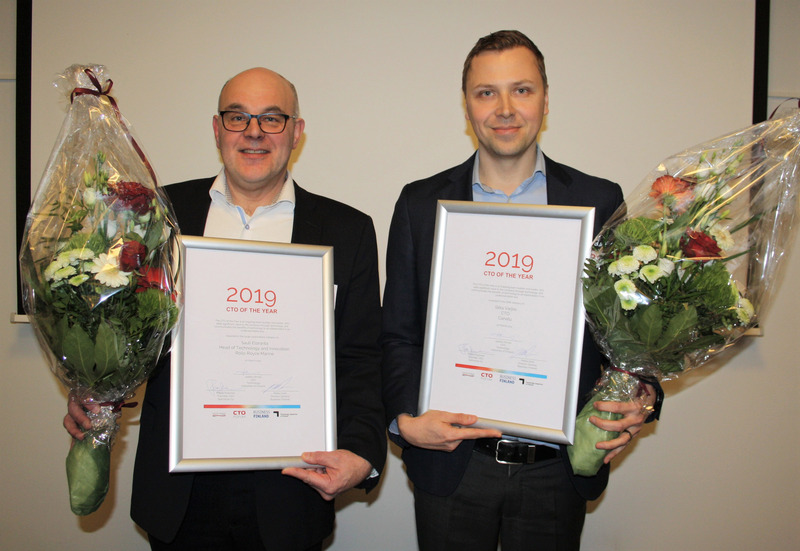 This year, Rolls-Royce Marine's Head of Innovation and Technology Sauli Eloranta was awarded the title of CTO of the year in the large-scale enterprise category, while Ilkka Varjos, CTO of Canatu, was chosen as the winner in the small and medium-sized enterprises category. The two share a common method of utilising research in product development and a focus on ecosystem building. “Rolls-Royce Marine utilises networks in its mission to bring an old, well-established business to a brand new era. Canatu, on the other hand, is using its networks to create and develop a completely new, ground-breaking future business. Both enterprises have brought the academic and business worlds closer together and been proactive in building bridges between them,” says the jury chairperson Jaakko Hirvola from Technology Industries of Finland. Rolls-Royce Marine is one of the global leaders in marine technology business. In Finland, Rolls-Royce has factories in Rauma and Kokkola. The factories plan, market and produce propulsion equipment for vessels. The company has an R&D unit in Turku that specialises in developing remote controlled and autonomous ships. Sauli Eloranta has already shaped the Finnish innovation landscape for over a decade. Especially his work with strategic competence clusters has had a lasting impact. When FIMECC, a metal and engineering competence cluster was founded, Eloranta was one of the central contributors in the creation of its first programme. As a result, a unique competence cluster of autonomous marine traffic, the One Sea company ecosystem, was born. It is the only business-driven ecosystem in the world for that purpose with leading enterprises as partners. One Sea is strongly associated with Eloranta, who is resiliently pushing the business forward in Finland. Eloranta estimates that autonomous maritime technology will play a central role in Finland's competitiveness in the future. According to Eloranta, a breakthrough for the branch would still require new operators and a lot of work. The existing technology should be applied innovatively and tested thoroughly to secure its safety. Changes in legislation would also be necessary. Compared to a singular company, ecosystems have better possibilities to affect the large-scale development of the business. “Ecosystems promote such things as supplier-independent compatibility in equipment systems, which advances the implementation of new technology,” Eloranta highlights. Carbon nanostructures are considered to be the next material that will change the world. It is predicted to disrupt many traditional businesses, such as electronics and chemical industry. Canatu is a spin-off company founded 10 years ago in the Aalto University physics faculty to develop a newly discovered material, carbon nanobuds. Canatu has already launched its disruptive technology. The company's formable 3D touch sensors are already in mass-production in the automotive industry. Canatu recently published a cooperation with the world's second largest automotive component producer, Denso. The companies are set to cooperate on a project concerning transparent film for heaters of autonomous cars. One of the first employees of the company was Ilkka Varjos, a man who has during the past years built an incredible network to support Canatu. With this network, the company has succeeded in commercialising university research, and also has been able to develop both carbon nanoproducts and nanomaterials alike. Canatu can be considered a true cleantech company. “In traditional touch screens, the material used to conduct electricity is indium tin oxide. It is mainly mined in China, it is relatively rare and can even be poisonous. In our processes, nanomaterial is produced from recyclable carbon-based gases”, Varjos explains. Canatu has already made its debut in the automotive industry, but the company aims higher than just one business. The chances for nanotechnology applications are unlimited. Ecosystems that connect research and product development play a key role in utilising nanotechnology to meet the needs of different businesses. “In the long run, these competences could draw in a sort of Nano Carbon Valley into the Helsinki area, where nanocarbon could be used as a platform technology for different applications,” Varjos envisions. The CTO of the year award is handed out for the 9th time this year. It is a recognition awarded to a central technology officer who has improved the technologic competences and growth potential of their company or enterprise, is an inspiring leader, and an active participant in societal discussion. The awardees are chosen by a jury of Finnish technology influencers. The jury's chairperson is Jaakko Hirvola of Technology Industries of Finland. CTO Forum is a Finnish community of CTOs. It invites all innovation and technological officers of Finnish companies to network, discuss and share ideas between businesses. CTO Forum’s mission is to promote the work of CTOs and businesses. CTO Forum is organised and the award is handed out by Business Finland, Technology Industries of Finland and Spinverse.